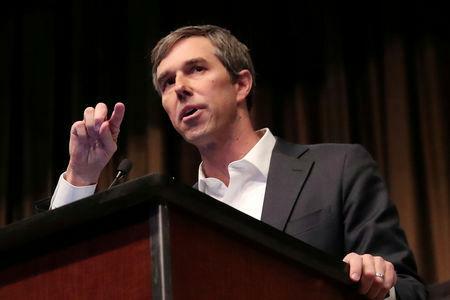 EL PASO, Texas (Reuters) - Democrat Beto O'Rourke has called for investment in a “world-class public school system" and says teachers make up the single biggest professional group contributing to his 2020 presidential campaign. But several teacher groups say the former Texas congressman's support for charter schools in recent years is complicating his efforts to secure their backing in his White House bid. Charter schools, most of which are publicly funded but often privately run, are a complicated issue for Democrats. Former Presidents Bill Clinton and Barack Obama supported them, viewing them as giving school choice to lower-income families. Charter schools have grown across the country in response to demand from parents for different options from traditional public schools. Many charter school employees are not unionized. But some teachers unions say they divert state and federal funds from public schools. They have raised O'Rourke's past positive comments about charter schools, as well as his wife's ties to them through her work, as points of concern as they scrutinize the Democratic field. "We’re going to have to get a lot of questions answered by Beto," said Norma De La Rosa, president of the El Paso Teachers Association in O'Rourke's hometown. "At this point, I would be wary and I think a lot of my colleagues are going to hit him hard on these points." Teachers and their unions are being eagerly courted by the large slate of Democrats seeking the party's 2020 presidential nomination to run against President Donald Trump, the expected Republican nominee. Educators are a key voting bloc in state nominating contests and have flexed their political muscle in the past two years with a wave of strikes and protests over better pay and resources. U.S. Senator Kamala Harris, a Democratic presidential contender from California, has proposed giving teachers an average $13,500 annual pay raise as a central part of her pitch to primary voters. The politics of charter schools has shifted since some prominent Democrats lent their support. Public schools have seen their budgets cut since the 2008 financial crash, hardening opposition to charters among many teachers. The Trump administration's strong support for charter schools has also increased Democratic antipathy. Another 2020 Democratic candidate, U.S. Senator Cory Booker, also is drawing scrutiny for his support for school choice and charter schools when he was mayor of Newark, New Jersey. Aides to O'Rourke say he is unequivocal in his support for public schools and has never taken any action to advance charter schools over them. He and his wife send their children to the same El Paso public school O'Rourke attended. "Beto has been a strong and consistent advocate for public school classrooms in Texas and across the country," Chris Evans, a spokesman for O'Rourke, said in an email. "He has made it clear that our focus should be on, and our taxpayer funds should go toward, public school classrooms where the overwhelming majority of American students attend. He believes we should be paying teachers a living wage." But O'Rourke's past statements about charter schools give some public education advocates pause. In 2016, when O'Rourke voted against a federal voucher program in Washington, D.C., he said money should be invested in "proven educational models such as charter schools." In 2015, O'Rourke said he voted for the Every Student Succeeds Act - which passed Congress with bipartisan support - in part because it gave parents choices by "investing in new charter school models." During a 2012 Democratic primary debate when he first ran for Congress, O'Rourke called charter schools "a good idea" because they encourage competition and innovation. O'Rourke's wife, Amy, works for an organization in El Paso that backs the expansion of charter schools in the area. In 2007, she opened a dual-language elementary charter school in a low-income neighborhood of El Paso. Evans said Amy O'Rourke's work had been focused on expanding opportunities for students in underserved communities. Anthony Cody, co-founder of the Network for Public Education Action, a national advocacy group for public schools that opposes charter schools, said his organization found O'Rourke's past comments and his wife's work in the charter school world "hugely problematic." Noel Candelaria, president of the Texas State Teachers Association, which opposes the expansion of charter schools in Texas, said it would be important for O’Rourke to make clear to his organization “where he stands on charter schools” now before he wins an endorsement. The association endorsed O'Rourke during his unsuccessful Senate bid last year against Republican incumbent Ted Cruz. Randi Weingarten, president of the American Federation of Teachers, the country's second-largest teachers union, defended O'Rourke's "nuanced" view of charter schools. "For us, it's not 'charters good or bad,' and if you listen to Beto's actual comments about public schools and charter schools, he gets to the same position: They can't siphon money from public schools, they can't take fewer kids with special needs." Weingarten said she recently talked with O'Rourke. "I think when he toured the (Mexican) border and spoke to teachers, it was very transformational for him," she said. "People's positions evolve over time."